Two-time state champion Matt Soto presents drills and exercises designed specifically to strengthen the abilities a goalkeeper. Practice is initiated with warm-ups structured to reinforce the goalie skill using correct footwork in an effort to properly position the goalie for lunging and stepping into the ball. Warm-ups start with players kicking the ball to each other. Correct foot position and striking the ball with a controlled, deliberate clearing kick is emphasized. Moving into shooting on goal, the tempo and skill set builds from simply stopping the ball to clearing the ball to a specific area of the field. Players are shown how to clear the ball after a shot and to direct the ball away from the center of the field to the outside of the shooting circle. Goalies who are able to master the techniques shown will effectively decrease their opponents scoring opportunities. Coach Soto introduces cones that the goalie must move through before stopping shots. 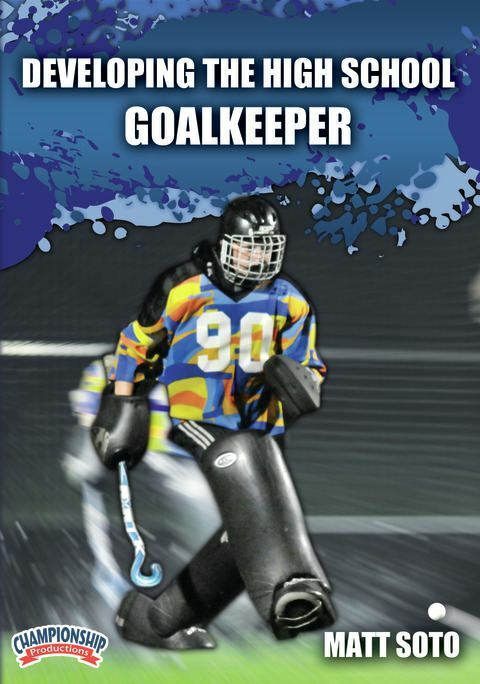 This increases the challenge to the goalie and helps them build confidence in their footwork. Soon the drills develop to include shots from two shooters. The drill is structured to force the goalie to quickly move from one side of the net to the other. All of the drills shown are strictly defined as goalie drills, therefore all shooting is performed to build a goalie-specific skill. The drills continue to progress by using several players shooting from multiple spots on the field. The goalie must be able to quickly react to the ball, set in a good athletic stance and successfully clear the ball. Additionally, this DVD provides clearly defined instruction for defending against a break away and 1-on-1 situations. Whether you are a high school goal keeping coach, a parent helping your young athlete, or a goalkeeper taking charge of improving your skills, the drills in this video will teach you how to achieve your goals.